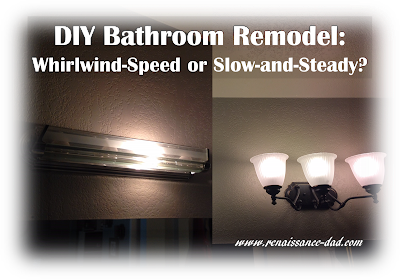 Renaissance Dad: DIY Bathroom Remodel: Whirlwind-Speed or Slow-and-Steady? DIY Bathroom Remodel: Whirlwind-Speed or Slow-and-Steady? In my life BK (Before Kids), I loved doing whirlwind weekend projects, especially when my wife was out of town. One time, when she was gone for three days, I drywalled in a doorway to the family room, cut out an opening between the living room and the family room, and installed french doors connecting the two rooms. During another trip, I gutted our bathroom, refinished the walls (pulling down salmon colored wall tile and drywalling significant portions of the walls), painted, and installed all new fixtures and a new vanity. It got to the point where I had set myself up for some amazing project completion when she was gone, so that I had to find something to do with each trip. To be honest, I really enjoyed the whirlwind speed remodels. I liked the amazing transformations that occurred, and the surprised look on her face when she came home. With the french door project, she walked into the house, looked at the french doors, and said, "That wasn't like that when I left on Friday." Success! (Aside: My wife wants me to tell you that not all projects happened while she was gone, and that she is not the globe trotter I make her out to be.) Honey, consider the public told! And then we had kids. Aside from kids being a money vacuum, greatly impacting the number of home improvement projects I could afford, they also to take up time. Of course I love being on full time parent duty when mommy is out of town, but I also think about the BK days of complete room remodels. This is actually named "Chateau." Not classy. So I have resorted to a slow-and-steady method of remodel. It started last year when I stared at our 1984 throw-back master bathroom: builder-grade faucets, mirrored closet doors, lavender paint that was hidden under mauve wallpaper, and light fixtures that cried out to illuminate crimped hair and neon leg warmers. Here was my internal monologue, very reminiscent of Bill and Ted's classic discussion: "I really want to replace the light fixtures. But if I replace the light fixtures, I will need to paint. But what's the point of painting when I need to replace the mirrored closet door with a pocket door? If I do a pocket door, and paint, I should also build a frame around the mirror to class it up. But why should I class it up with those hideous faucets. Before replacing the faucets, I should replace or refinish the cabinets. But why invest in new cabinets when they share a wall with those ugly light fixtures?" Before I knew it, I was setting myself up for a complete bathroom remodel in a weekend, which I knew I couldn't do. So I took a breath, told myself it would be okay, and took the first step. Last fall, I got a good deal on some light fixtures, so I replaced those. Underneath the light fixtures were some wallpaper remnants, which I removed from the wall. But I resisted the need to immediately paint the entire bathroom. I took another breath, and contented myself with a completed step 1. In March, when my wife was out of town, I spent an evening painting the bathroom. You're probably thinking, "But, R.D., what about the pocket door?" I know, I know. Eventually I will install one, and then I will have to paint again. But this is not life BK, so the bathroom got a much needed paint job to complement the new light fixtures. Check off step 2. Then, last week, I got a great deal on two bathroom faucets. I took so many deep breaths that I installed one in an evening when I had time, and then waited two whole days before I got the next one installed. Step 3 is now complete, and I only have about six more steps to go. It's like I don't even know who I am any more. Actually, this slow-and-steady approach is nice in a way. For one thing, I can wait until I get a great deal on supplies, so I'm saving quite a bit of money (I got $180 in faucets for $60, mainly because time did not dictate when the project needed to be completed). For another thing, my idea of what I want the bathroom to look like has changed over the past several months, so I am able to adjust my plans along the way. I'm sure, if money were no object, I would be able to carve out an entire weekend to complete a project like this, and I am sure my kids would be vitally important in helping out with the project (Big E was a great helper on the faucets project. Her job was to scream her head off in the event of a water geyser, while I went outside to turn the main back on. To her great disappointment, my plumbing didn't leak.). But the slow-and-steady approach also lets me spend time with the kids doing things that they want to do. Midway through faucet one, I stopped and read a book with Little E. After the second faucet was installed, I got to swim with the kids in our beautifully remodeled pool (if you missed that project, check it out here). So while the BK whirlwind-speed remodel side of me hasn't completely died, I am trying to embrace the slow-and-steady approach during this season. But at some point in the future, when our kids are older and I'm able to whirlwind again, my wife better watch out. Because I can only imagine what damage will be done after a long hibernation. it doesn't really matter that much if the project was done in a whirlwind or slow and steady speed. What's important is are you achieving the goals that you have? Is the plan working, and is it giving you outcome that you want? Just like what slow and steady speed way is doing for you. You are enjoying a lot of benefits without sacrificing the chance of making a better home. I absolutely agree. There is room for both slow-and-steady and whirlwind projects. My difficulty comes in accepting that my life has changed so much that my project speed must also change. But as long as I am continuing to getting great outcomes that improve our home, and as long as my family is happy, then I'm happy!